Your exciting Iberian adventure introduces you to fascinating cities and cultural discoveries on your affordable tour of Spain and Portugal. You’ll stay three nights in Madrid, two nights in both Seville and Lisbon, and one night in Coimbra. Enjoy sightseeing with a Local Guide-an expert in the city’s history and sights-in Lisbon, Seville, and Madrid. The included city tour focuses on the must-see sights, including Seville’s three UNESCO World Heritage sites within walking distance from each other, and Lisbon’s Belem Tower, a UNESCO World Heritage Site built around 1514 to commemorate the expedition of Vasco de Gama and to defend the port of Lisbon. 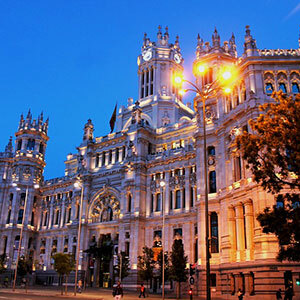 In Madrid, you will see the Puerta del Sol – the “gate of the sun” – and admire the impressive architecture of the wide alleys crossing the city center.